How can I use conditional formatting by using the note on a specific or many cells in Google Sheets? For example, I would like to set up conditional formatting to a specific cell and when I use a note on that cell it will automatically change the color. 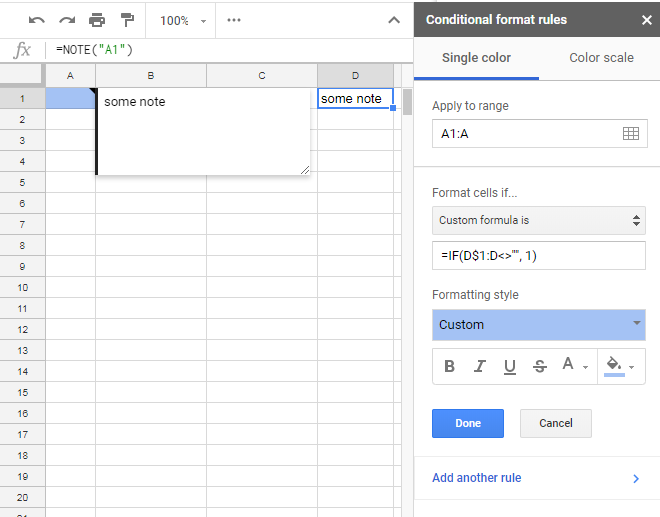 The built-in conditional formatting feature of Google Sheets can't be used to directly format cells based on notes content but you could use and add-on or Google Apps Script to do a conditional formatting tool. This function runs every time a cell/range is edited. If the cell/range has a note the cell/range background color will be set to green. NOTE: The onEdit simple trigger isn't triggered by inserting a note. As an alternative of a simple trigger you could make a script that check all the sheets cells calling it from a custom menu, from the script editor, an image or custom dialog/sidepanel. Not the answer you're looking for? Browse other questions tagged google-sheets google-apps-script formulas conditional-formatting or ask your own question.